You’ve got great products, your ads are laser-focused, and you’ve done so much A/B testing and tweaking your eyes are starting to go blurry. You’ve done everything you possibly can to get the highest conversion rate possible. In fact, it’s going to be the highest conversion rate of all time. You’re on top of the world. You’re a true marketing genius, and are ready to just sit back and watch those rates go up. That’s when you realize your landing pages may not be as great as you think. Your potential leads are floating away and your sales are getting smaller and smaller. Your competitors are taking your customers and building relationships you should have had. Because their first impression made more of a lasting impact on the customers than yours did. But, don’t worry. 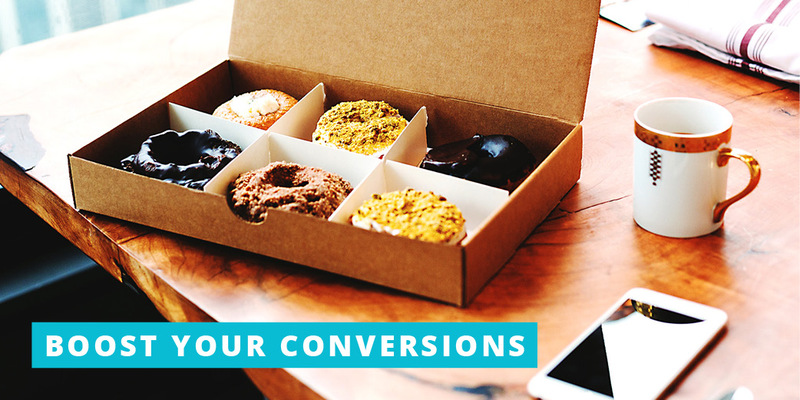 You can still increase your conversion rates and get those customers to love your brand. Just remember: The conversion rate improvements don’t come from great ads, they come from great pages. In this post, you’ll see how you can use these proven strategies on your own site to increase those conversion rates. Nobody wants to sit there, filling out box after box after box of their information. In truth, the lead generation/capture form is actually the easiest area for you to improve your conversion rates. When asking for information for your email opt-in form, you want to make sure you’re asking as little as possible of the customer. There have been tons of studies done on landing page forms as marketers try to figure out the best way to increase their conversions, but keep their cost per acquisition down. The key here? The less information you require, the higher your conversion rate is going to be. Think about it: How many times have you thought about signing up for something, but then saw how many boxes you had to fill out and decided it was just too long? You’ve got more interesting things to do with your time than fill out tiny boxes. And so do your customers. On another note, you also want to take into consideration that you can choose between single opt-in and double opt-in when it comes to your list settings. The single opt-in is quicker and simpler, while the double-opt in minimizes the chance of error or false addresses coming through. Now, sales pages are different. Including opt-ins directly on sales pages comes across as pushy and demanding, and doesn’t allow the prospective customer to feel like they have a choice in the matter. Instead, make the email collection a part of the purchase process. If someone is buying from you, you’ll need their email anyway to issue a receipt, so just streamline the entire thing by making the opt-in a default that they can always opt-out of! Do split testing to see what works best for your audience, but always remember: less is more. Considering the fact 85% of consumers claim to read up to 10 customer testimonials before they decide they can trust a business, testimonials are some of the most important aspects of any landing page. Testimonials cut down on risk and provide your consumers with the social proof they’re looking for, but you want to make sure they aren’t generic. “Tons of fun!” – Jesse A. “We make tons of money now!” – Frank H.
And the most unhelpful one ever . . .
Not only are these really short, but they don’t seem legitimate at all. Who are these people and why should your consumers care? You may have customers that don’t own a business, or have any main title under their name. But, they should explain exactly how you helped them and with what. Also, super important to note – it’s illegal to “pass” testimonials! There have been numerous cases where one person tries to collect social proof, then rebrand for another person, and then have that new owner try to sell the product with the same reviews. These businesses not only get caught, but they develop a negative reputation within the industry and end up losing customers. Don’t let that happen to you. Make sure each review is specific to the product being sold, and that it’s only being sold by your brand. When in doubt, check out the Federal Trade Commission guidelines for reference. You want the reviews to not only be specific to a particular product or service you provided, but you also want them to be full of helpful details. The more details included in a testimonial, the more real or ‘human’ that testimonial seems. Which means your customers are more willing to listen to them and take that person’s experience into account when making purchasing decisions. Word of mouth is one of the most effective, and oldest, forms of advertising. Make sure your landing pages use that to your advantage. Show them you have the answer they’ve been looking for. They need to know you will be there for them, that you care about them and not just their wallets, and that your products/services are the solutions to their problems. Promise them greatness, but don’t over-deliver. False claims are the fastest way to build a negative reputation and lose customers. Instead, include things like a no-questions refund policy on all purchases. Not only does this make a prospective customer feel safe in their purchasing decisions, but the increased sales that come from it tend to make up for any returns that may occur. We all know the headline is one of the very first things someone sees when they visit your site, but did you know that, on average, only 2 out of every 10 people keep reading after the headline? That’s why you need to pay it some extra special attention! Solve a problem, provide a solution. Make sure it matches your ad. Consistency is important in all aspects of branding, from your colors to your headlines. The largest size text should be reserved for headlines, with smaller sizes being used for all other content (i.e. subheadings or body text). Choose a typeface that is easy to read, and colors that aren’t loud and hard on the eyes. Use powerful sales words that elicit emotion. Discover, Results, Secret, Free, Guaranteed, Quick, Simple, NOW, etc. Make sure the tone fits your audience. Use humor if appropriate. These are just a few tips to get you started on tweaking your headline to increase landing page conversions. But, be sure to get creative with them and do split testing to find the right headlines for your target audience. Have fun with it and, above all, remember to be honest and compelling, and make your customer want to know more. As marketers and business owners, one of the most important things you do is get people to take some sort of action. It’s also one of the hardest things you do. That wouldn’t get you anywhere. No, you have to attract, engage, and compel your reader to carry about an action you want them to take. Using the word ‘you’. This feels personal, draws the reader in much more and it reduces risk of pronoun issues. Having strategic placement. Marketers have been saying for years and years to put the call-to-action at the top of the page, above the fold. But, they’ve come to realize something else. The reader isn’t always engaged at the top of the page. They just started! By putting a CTA lower as well, they will have read the full article, they’ve invested emotion and time in it, and they likely want to share the valuable content with others. Incentivize it. Include a value-driven offer, such as a free eBook, and let them know it’s for a limited time. People respond to urgency and the feeling something is in it for them. Use action verbs: “Grab your copy today” and “Save your spot” are great examples. The trick is to make them feel like it was their idea to sign up, rather than a result of them being told what to do. Why should they buy your product? What’s in it for them if they invest in your service? These are the types of questions your landing page should be able to answer at a glance. That’s why it’s important to list all the features of your product in a way that tells your prospect exactly how it will solve their problem or help them. No two people are the same, and you will likely have a wide variety of people coming to your site. For some of them, speaking on the phone is a difficult task. Some people don’t like speaking on the phone. Others have social anxiety and don’t like talking to people they don’t know very well. Whatever the case, calling someone can be a nerve-wracking experience for many people. However, having a live chat option is a great way to allow prospective customers to get answers without having to pick up the phone. It’s can also be a lot faster than email, especially if the question or concern is a very quick one. The best kind of chats are those that just get the ball rolling without needing to sign in, create an account, or give information like a name and email address. Having a this option is not only inclusive, but demonstrates your brand’s value because you offer the solution to their problem almost instantly. If you’re just starting out, chat may be a bit too high-level to implement right away. So, just be sure to include a support email in an easy-to-find place on the page. That way, you are still available and your prospective customers can reach out to you right away if they have problems or concerns. Brands that are easy to reach are able to build way better brand trust! Believe it or not, not everyone wants to use PayPal. Consider offering various methods of payment to satisfy the preferences of all your potential customers. If a prospective customer is unable to find their preferred method of payment available on your site, they will most likely abandon their cart and just go somewhere else. They’ll probably head on over to Amazon, who does offer multiple payment types. In fact, it’s a simple thing that helps customers have such a positive experience shopping with them. It’s easy, it’s quick, and it’s convenient. That’s why over 40% of its revenue comes from repeat customers. It’s great to have strong copywriting and graphics, but multiple types of content means readers don’t get bored. It keeps their attention, and appeals to a wide audience. Video and arresting images capture your reader’s attention and keep them interested. It also makes your site more interactive and appealing to a wide variety of individuals, which helps boost your sales and other conversions. You could have the best ads in the world, with perfect placement and a strong call-to-action. You could have great products that would perfectly fit all the needs of your target customers. But, none of that matters if they lead to a page that falls flat. If your readers aren’t engaged, compelled to take action, and interested in what you have to say, they aren’t going to convert to subscribers or paying customers. Try these tips, and you’ll see increased conversion rates in no time! What tips would you add to this list? Let us know in the comments below and, while you’re here, be sure to pass this on!